“The nursing program at Ramapo College was a challenging program that incorporated a variety of learning methods, such as: hands on simulation lab experience, exams, tutoring, clinical rotations, evidence-based projects, and proctored exams. The last two years required a lot of time and dedication. Thanks to the exceptional and caring faculty, I was able to successfully complete this program. The professors were always available for any questions or concerns I had; and I am truly grateful for all the support. 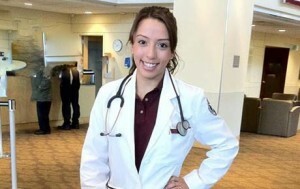 I couldn’t be any happier with my choice of Ramapo College’s nursing program.” – Thalia Lopez ’15 received the Outstanding Academic Achievement Award in Nursing and graduated with Latin honors. While at Ramapo, she was a member of the Nursing Student Organization, the National Society of Collegiate Scholars, and Delta Phi Epsilon. She has now become a member of the nursing honor society, Sigma Theta Tau. She successfully completed her clinical rotations and is part of the Emergency Department Ambassador Program. Upon graduation, Thalia accepted a Nurse Residency position as a full-time, cardiac nurse at Valley Hospital in Ridgewood, NJ.